The Alcatel-Lucent OmniAccess™ WLAN Switch/Controller product family provides the industry’s strongest integrated security feature set with a comprehensive line of WLAN switch/controllers, each designed for a specific environment such as the enterprise campus, buildings and branch office environments. Standard with every wireless LAN, the Alcatel-Lucent OmniAccess base software provides unprecedented control over the entire wireless environment and enables advanced adaptive WLAN, identity-based security and application continuity services. The base feature set of Alcatel-Lucent OmniAccess wireless LAN base software includes sophisticated authentication and encryption, protection against rogue access points (AP’s), seamless mobility with fast roaming, RF management and analysis tools, centralised configuration, location tracking and much more. The Alcatel-Lucent OmniAccess Wireless RFProtect module is an optional software module  installed on Alcatel-Lucent WLAN switch/controllers. RFProtect safeguards the network  infrastructure against wireless security threats as well as providing a critical layer of visibility  into sources of radio frequency (RF) interference and their effect on wireless LAN (WLAN)  performance. The PEFNG module provides identity-based security, quality of service (QoS) control and traffic  management capabilities to a user-centric network. 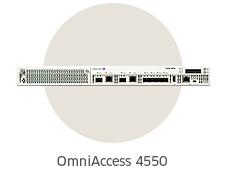 Alcatel-Lucent offers numerous access points (AP’s) that work with OmniAccess WLAN switches, each offering a different set of features allowing customers to select what they need for their particular application. The AP’s are small, lightweight and can be securely deployed in a variety  of locations including outdoors for some models.